It’s been quite a while since I did a wishlist – I always like to enjoy any Christmas presents I received and anything I treated myself to with Christmas money at least for a couple of months before I go on another spending spree. But it’s payday tomorrow and I must admit I’ve accumulated a little list of things I’d like to purchase. As ever I have a major fashion split personality, I think I’ll forever be concurrently lusting after pretty dresses and then more casual items like chunky boots, leather lackets and casual tees. 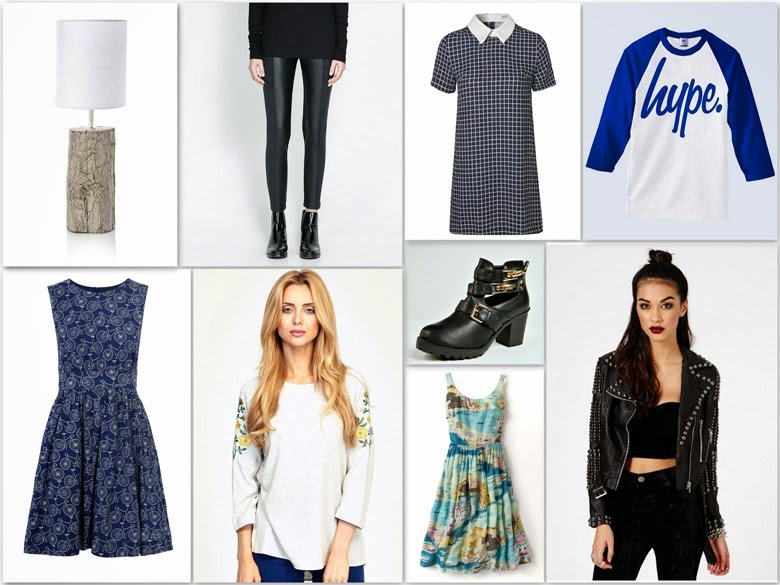 Without further ado, here’s the pieces that might be getting a little slice of my bank balance over the coming days. 001. This beautiful lamp from lighting at French Connection (£65) is a bit lovely and would look perfect in my ‘beach hut’ conservatory. 002. I’ve been eyeing up these Zara combined leggings (£19.99) for some time now and I think it might be time for them to finally be mine. 004. I love the colours on this Hype raglan/baseball tee (£21.99), I think it would be super comfy to wear with jeans for a casual weekend look. 005. This bicycle dress from the new Emily and Fin range at Kiki’s Boutique (£59) is just perfection, I’m in love! So many other lovely dresses in the new range too. 006. Another casual weekend piece, I love this ‘Springtime sweatshirt’ from Sugarhill Boutique (£45), the embroidered flowers are so pretty. 007. I have been after some more chunky cut-out boots for ages and I love these ones from Boohoo (£35). 008. This Nancy Dress from Boden (£89) is so, so lovely, the cut and the print are perfect for dreaming of summer-y days! 009. I love this studded biker jacket from Missguided (£84.99) – I think it might have just sold out so I’m hoping for a restock!